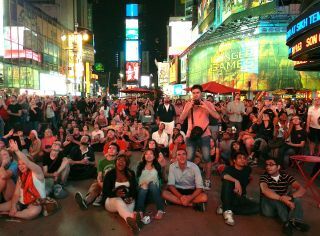 Around 1,000 people watch NASA's Curiosity rover land on Mars from New York City's Times Square on Aug. 5, 2012. NASA astronauts on Earth and in space will help usher in 2014 from New York City's Times Square tonight, space agency officials say. Among the thousands of revelers expected to flood into Times Square for tonight's New Year's Eve celebration will be NASA astronaut Mike Massimino —a New York native —who will be part of the live countdown to the year 2014. "He also will introduce a video greeting from Expedition 36 flight engineer Karen Nyberg, who returned from the International Space Station in November, and from three of the astronauts currently on board the space station: NASA's Rick Mastracchio and Mike Hopkins, and Koichi Wakata of the Japan Aerospace Exploration Agency," NASA officials said in a statement. Astronaut Mike Massimino cameos as himself in a new episode of the CBS sitcom "The Big Bang Theory." Will Massimino and his fellow NASA astronauts sing the traditional Auld Lang Syne? Or make New Year's resolutions? We'll have to watch and see. The New Year's countdown tonight will be broadcast live on the Toshiba Vision screen atop the iconic One Time Square building just under the glittering New Year countdown ball. The broadcast runs from 6 p.m. to 12:15 a.m. EST, with Massimino taking the stage at 9:47 p.m. EST to introduce the video messages from space. "Prominently positioned below the world-famous Times Square New Year's Eve Ball, the dual LED screens will allow revelers in Times Square to see this special greeting from space," NASA officials said. Earlier today, Wakata radioed Japan's Tsukuba Space Center, which houses the operations center for the station's Japanese Kibo module, to send a New Year's message to his colleagues on Earth. "Happy New Year to you all," Wakata said. "I wish you all the best for this New Year." The International Space Station is currently home to six space travelers. Russian cosmonauts Oleg Kotov, Sergey Ryazanskiy and Mikhail Tyurin are also aboard with Wakata, Mastracchio and Hopkins. Kotov commands the crew and all six have an off-duty day today, NASA officials said. Massimino is NASA's most followed astronaut on Twitter (with 1.2 million followers) and has made guest appearances on the hit TV sitcom "The Big Bang Theory." He is a veteran of two spaceflights, both of them to repair and upgrade the Hubble Space Telescope. NASA's New Year's Eve astronaut appearances aren't the first time the space agency has brought space exploration to New York City's Times Square. In 2012, NASA broadcast the Curiosity Mars rover landing live in Times Square, drawing at least 1,000 viewers. Two other launches have also been streamed live in the NYC landmark, NASA officials said.